Shudders as he settles to rest. The comic beast will fly. Appear content, though restless on their captive perch. Marquardt, Elizabeth. 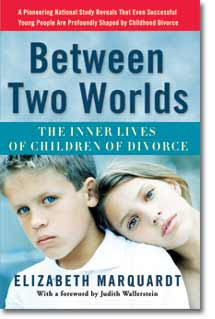 Between Two Worlds: The Inner Lives of Children of Divorce. New York: Three Rivers Press, 2005. 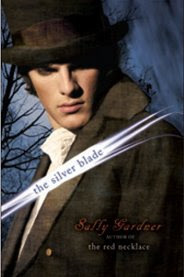 I found this book by visiting the blog of Lauren Winner, an author I have recently discovered. She had chosen to read this book because she said she saw herself on every page. Although I generally avoid the victim mentality that often comes from reading books about how traumas in a person's life have warped that person so he or she cannot choose to behave differently, I was intrigued by this particular book. This book is the culmination of a study of children who both came from divorced families and completed at least one college degree. The author's hypothesis was that such children would generally be considered successful by the world around them, yet she wanted to see how growing up in a divorced home changed the way children think and feel and approach the world. I am nearly finished with this book, but it definitely merits a second reading. I am not looking for excuses at all - my sinful behavior is the result of my wrong choices, and I bear the responsibility for that. However, it is comforting to know that at least there is an explanation for why I tend to think or react a certain way to events in my life (like the stress of moving, yet again, and packing my life into boxes). Baccalario, Pierdomenico. 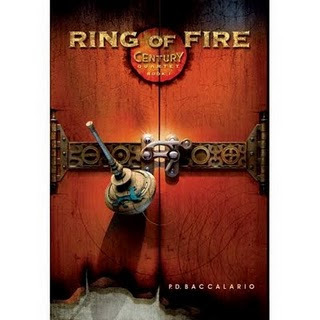 The Ring of Fire. Random House, 2009. I was not impressed with this book. It reads much like a Dan Brown novel written for teens. The characters are flat, the mystery is not that mysterious, and the suspense was, well, unsuspenseful. I was glad to be done with this book. These are both good stories of the French Revolution. The second book does become a bit tedious, but the information about the French Revolution is accurate and the relationship between the Gypsy boy and the aristocratic girl is interesting. Again, a good vacation read. Knudsen, Michelle. 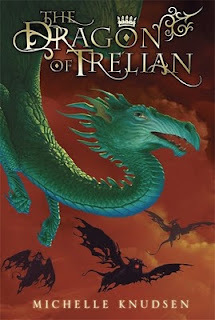 The Dragon of Trelian. Somerville, MA: Candlewick Press, 2009. I like dragon books, but I will admit that they can often run in very predictable patterns. Not so this book. This twists in the plot and the connections between the mage's apprentice and the princess were entertaining. It is obvious that another book in this series could be forthcoming. This was a good vacation read. Kelly, Jacqueline. 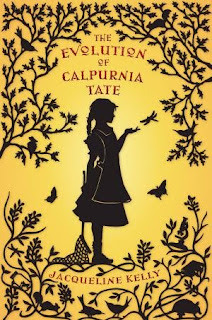 The Evolution of Calpurnia Tate. New York: Henry Holt and Company, 2009. In the summer of 1899 in Texas, Callie Vee does not have much to look forward to. Her mother is convinced that Callie needs to prepare for "coming out," which involves cooking lessons, sewing lessons, and deportment lessons. In her attempt to escape both the summer weather and the pressure from her mother, Callie befriends her grandfather, the one member of her family who is usually ignored and barely tolerated. Grandfather inspires in Callie an interest in science, and Callie dreams of going to a university and becoming a naturalist. 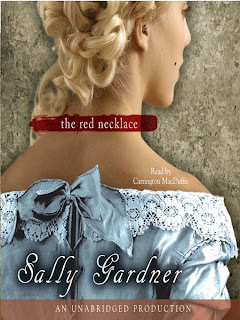 Although this book does not fit into one of my typical genres, I appreciated both the period-appropriate descriptions of the setting and the relationship Callie develops with her grandfather. It was neat to watch the two of them interact and to see Callie's brothers' reaction to her friendship with Grandfather. This book will not make it to my classroom shelf this year, but once it is printed in paperback, perhaps I shall add a copy to my library. Crowley, Suzanne. 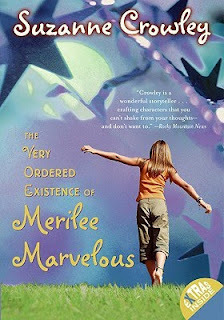 The Very Ordered Existence of Merilee Marvelous. New York: Harper Collins, 2007. This story is told from the point of view of the protagonist, a preteen with an Autism Spectrum Disorder. She has a "very ordered existence," and has scheduled out exactly what she will do each day. This way of living has worked well for her, until Biswick moves into town. Biswick, a young boy with problems of his own, is determined to be Merilee's friend. His appearance in her life disrupts her "very ordered existence," and she has to choose whether to go back to the safety of her schedule or to choose to really live. "You've set up a nice little existence for yourself here, Merilee. A safe place that you will never have to venture out of your whole life. Believe me, I know. And you're always looking for an excuse to stay in your little make-believe world. Poor Merilee Monroe. Has the biggest bucketload of woes around so of course she can't love anyone. Well, let me tell you--I'm here to tell you the Lord Almighty up above wants you to grow up and love and be loved." This book is both entertaining and thought-provoking, and I will probably read this book out loud to my class next year. Boyne, John. The Boy in the Striped Pajamas. New York: David Fickling Books, 2006. "If you do start to read this book, you will go on a journey with a nine-year-old boy called Bruno. (Thought this isn't a book for nine-year-olds.) And sooner or later you will arrive with Bruno at a fence. Fences like this exist all over the world. We hope you never have to encounter such a fence." I saw the movie based on this book maybe a year ago. Although I thought it was a good movie, I wasn't that excited to dive into the story in book form. However, as is usually the case, I found the book to be better than the movie. 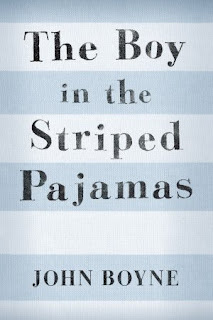 This book follows the story of a German boy named Bruno whose family has to move after his father's promotion. The "Fury" promotes Bruno's father to commandant and places him in charge of a place Bruno calls "Out With." While living in his house on the outskirts of "Out With," Bruno goes exploring and encounters a boy who lives on the other side of the fence. Shmuel is Bruno's age, and Bruno is very glad to have found a friend, albeit a friend who lives a very different life than Bruno. I found it intriguing to view the Holocaust and World War 2 through the eyes of a small boy. He doesn't understand what is going on around him; his concerns are only that he misses his friends and wants someone to play with. He sees himself as very similar to Shmuel: they were both forced away from their homes and everything familiar and both want desperately to return to what was normal. I do not recommend this book to young children; however, the difficult subject matter was well handled, and it may end up on my list of "books a person must read to call himself or herself a human being." Lueders, Beth J. Lifting Our Eyes: Finding God's Grace Through The Virginia Tech Tragedy. New York: the Berkley Publishing Group, 2007. This book provided a quick Saturday afternoon read for me while I was avoiding grading a stack of papers. It intrigues me that Christians are so quick to publish memoirs after incidents like this; however, I can understand taking advantage of an opportunity to be a testimony to the rest of the world. We do handle suffering differently. "I feel so scared/I don't feel safe..."
But the truth is it is normal right now for me to feel unsettled. I have been through so much. Grief and anxiety have gotten all tangled up and I feel like a mess. I feel the Lord is giving me permission to cry and to rest. But, God, [Y]ou are enough for this nightmare. You are my safety. You are my comfort. I choose right now to trust [Y]ou and I will choose not to camp my thoughts on the memories of what happened. it is okay for me to move my thoughts to a more whole place to heal my heart now. I thank [Y]ou for [Y]our promise in Matthew 11:28-30 that I am yoked together with you. "I am thinking about the bad memory again ..."
Lord, what is it that you want to tell me and show me? I invite you into my memory now. What are you saying to me? If there is something from the bad memory that I am to learn, let me know that now. If not - I am going to choose to change channels. I am going to focus on you today as many times as I remember. Lord, I thank you for healing me more each day and strengthening me. Thank you for the feeling of compassion that has arisen from this. May I see the other strengths you have given me during this dark season of my life. "I feel overwhelmed and depressed ..."
But the truth is, what I have been going through is overwhelming. My emotions are exhausted and depleted. That's why I feel depressed. But the truth is, I don't have to stay in this condition. I can take every detail to you, Lord, and ask for clarity and then ask for grace over it. If I resist your grace, I could even become bitter. You want me well. I am asking for your grace. "I just want to escape from all this forever ..."
But the truth is, it is natural and normal to want to escape this forever. But, Lord, you have fully equipped your children for battle. You have said that in this world we will have tribulation and hardship. It feels almost too hard, but I choose right now to go deeper in you; for as I abide in you, I shall be given all I need to recover from this.